Plants flowering to 0.6 m. Leaves erect to spreading, bright green, 20--40 cm, not covered with conspicuous, white, chalky powder; sheath pale or slightly darkened toward base, elliptic; blade narrowly triangular, apex attenuate. 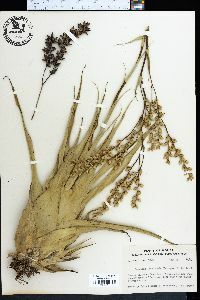 Inflorescences: scapes erect or leaning; bracts foliaceous, imbricate, spreading; inflorescences usually 2-pinnate, with 5--15 lateral branches; spikes 15--50-flowered, erect to pendulous, stipitate; floral bracts green, ovate, 4--5 mm. Flowers diurnal; sepals yellow-green, broadly elliptic, 4--6 mm, leathery, apex obtuse, surfaces glabrous; petals erect to very slightly spreading, white, elliptic, 6--8 mm; style included, stigma erect, simple. Fruits ellipsoid, 8--10 mm. Flowering fall--winter. Epiphytic on a variety of hosts in humid, shady situations; 0--30 m; Fla.; Mexico; West Indies; Central America; South America. OTher Reference Correll, D. S. and M. C. Johnston. 1970. Manual of the Vascular Plants of Texas. Renner, Tex.